We had at least two holidays in Barmouth, on Cardigan Bay, way out towards the fringes of the Western Region. 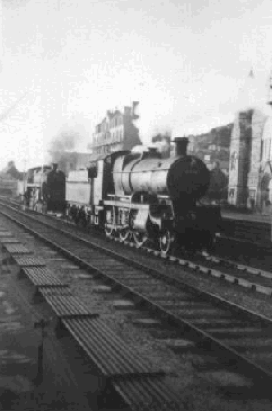 "The Cambrian Coast Express" left from Paddington of course and ran via Birmingham Snow Hill to Shrewsbury. For the first stage of the journey we had a "King" or a "Castle", but at Shrewsbury the exotica began. On a summer Saturday the "Cambrian Coast" was usually double-headed as far as Machynlleth if not beyond and usually turned out a "Manor" (a rarity for us Londoners), and a 43XX in green livery, or best of all one or two "Dukedogs", ancient 4-4-0 survivors from another century. Maybe we had another engine change at Machynlleth, I'm not sure. Barmouth itself was a delight, a busy passing place on the single track up to Pwhelli, Caernarvon and Bangor, and the terminus of the push-pull to Dolgellau and Bala. There were also at least two daily freights, plus the romantic "North Wales Land Cruise" or "Radio Cruise." 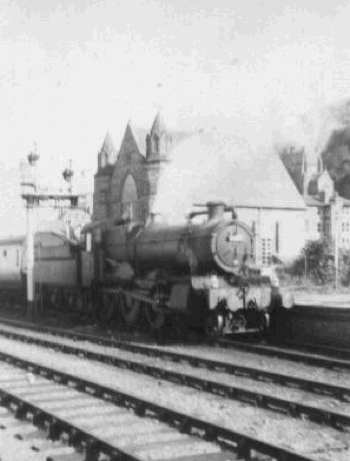 This latter ran in the summer, anti-clockwise from Bangor (I think) via Portmadoc, Barmouth, Dolgellau, Bala, to Rhyl, where it stopped for perhaps 3 hours, then continued anti-clockwise back to Barmouth, and possibly further. It usually had a Standard 75XXX or maybe 76XXX at its head. It featured the novelty of a "radio" commentary in each coach (open, not compartment), on the beauty of the scenery and the history of the area. 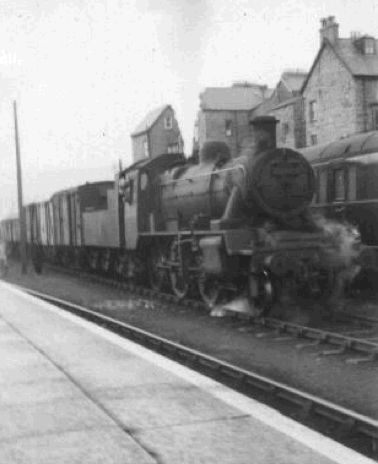 and a southbound freight behind surely one of the ugliest classes ever built, Standard 78XXX 2-6-0 no 78002, leaving the station across the level crossing which divided the town from the seafront. Both on a summer evening in 1958. This must have been one of the earliest locos on the Cambrian Coast to have the new BR roundel. Extremely clean 2251 class 0-6-0 no 2255 waits to head North from Barmouth on a passenger train. Below on the left, BR Standard 78XXX 2-6-0 no 78005, with a freight in the down yard. 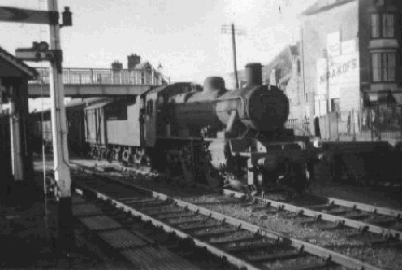 On the right, one morning in summer 1958, ex GWR 2-6-0 no 7817 "Garsington Manor" in the up bay platform, which was separate from the main station, on the south side of the level crossing.